Ever have one of those days where you just feel like eating something light and refreshing especially with this hot weather? Yesterday was one of those days for me. I was pretty much sick of eating chicken or red meat and needed some change. 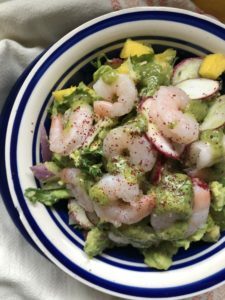 One of the dishes I prepared was this delicious super easy shrimp avocado salad. It’s the perfect appetizer or side dish to any meal even a perfect lunch that can be made ahead of time. 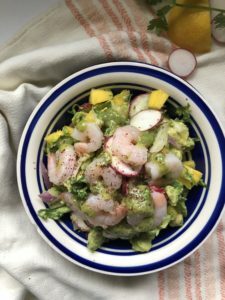 The radishes and nuts give a nice crunch while the mangoes add a subtle sweetness to the tangy salad. You can even substitute the mangoes for sweet corn if you prefer; they both would do the salad justice. Also, I highly recommend trying the Green Goddess dressing from Trader Joe’s. It pairs perfectly with this salad and would act as a great dip or spread on a sandwich as well. 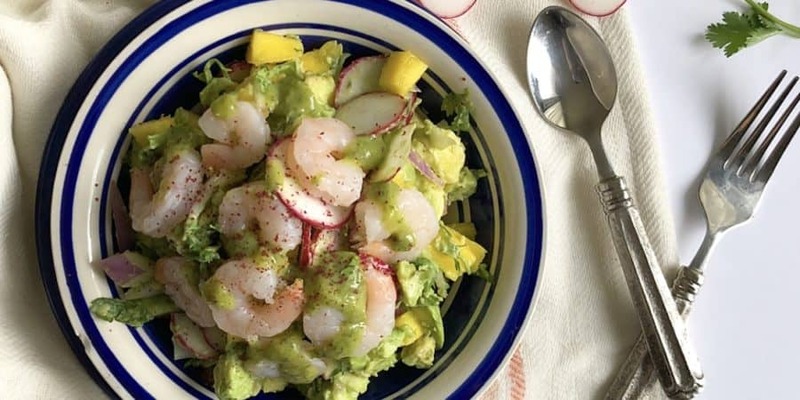 In a bowl, add the mango, avocado, cilantro, onion and add the shrimp as well. To that, add the sumac, lemon juice, and green goddess dressing. Season the whole thing with salt, pepper, and garlic powder. Finish it off with the chopped nuts on top. Mix together and enjoy!